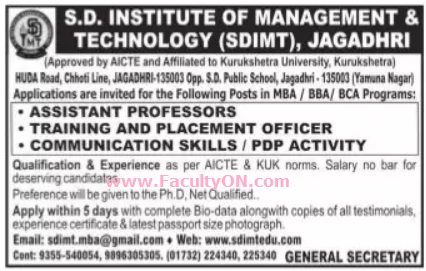 S.D.Institute of Management & Technology, Jagadhri has advertised in the TRIBUNE newspaper for recruitment of Assistant Professor Plus Non-Faculty jobs vacancies. Interested and eligible job aspirants are requested to apply within 5 days from 05th July 2018. Check out further more details below. About College: Encompassed by the sprawling greenery, a long way from the hustle and the clamor of the city yet housed in excellent structures furnished with all current luxuries, S.D Institute of Management, (SDIMT) have been cut out for having a spot of pride in today and tomorrow’s globalized ethos of innovation and administration. Sanatan Dharam foundations are quick picking up greatness as establishments of notoriety through their comprehensive approach in conveying training, offering refreshingly new viewpoints to youthful personalities alongside encouraging the achievement of their inventive abilities. How to Apply: Interested candidates are requested to send CV along with copies of certificates / testimonials and recent PP size photo to the postal address or email address provided below.